Titan Wraps can help you with vinyl wraps and branding in Carrollton TX, Dallas TX, DFW, Frisco TX, Lewisville TX or Plano TX. They specialize in custom wraps, graphics and decals and they can help you grow your business. Vinyl is a synthetic plastic that has many uses. The discovery of this extremely versatile product was not by design, but by accident. It was accidentally discovered in the search for an adhesive product that could bond metal and rubber. Today vinyl, also known as PVC has many uses. Wrapping is one of them. 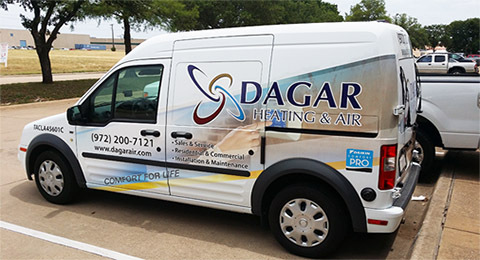 Vinyl wraps can used for vehicle graphics, general branding, retail graphics and more. Just about any hard surface can be wrapped. Vinyl wraps can be applied to cars, trucks, vans, buses, trains, boats, trailers and more. They can also be applied to walls, windows, doors, ceilings, appliances, tables, desks, tool boxes, mail boxes, garage doors and more. Vinyl wrapping is a relatively inexpensive process. Vinyl wraps are cheaper than paint jobs. In addition you can achieve just about any design and style with vinyl wraps. It is also a quick process and can be completed in a day or two. It is therefore an excellent way to market, brand and promote your business. One of the best examples is vehicle wrapping. Vehicles are seen by many and that is what make vehicle wrapping and effective marketing tool. A vehicle wrap can transform your car, truck or van into a mobile billboard. You can also use vinyl wraps to brand your building, retail of office space. There are many ways you can use vinyl wraps to promote your business, organization, cause or event. If want vinyl wraps in Carrollton TX, Dallas TX, DFW, Frisco TX, Lewisville TX or Plano TX, then Titan Wraps can help.